Cathy's boss at the US Fish and Wildlife Service gave her six months to work from anywhere in the world. 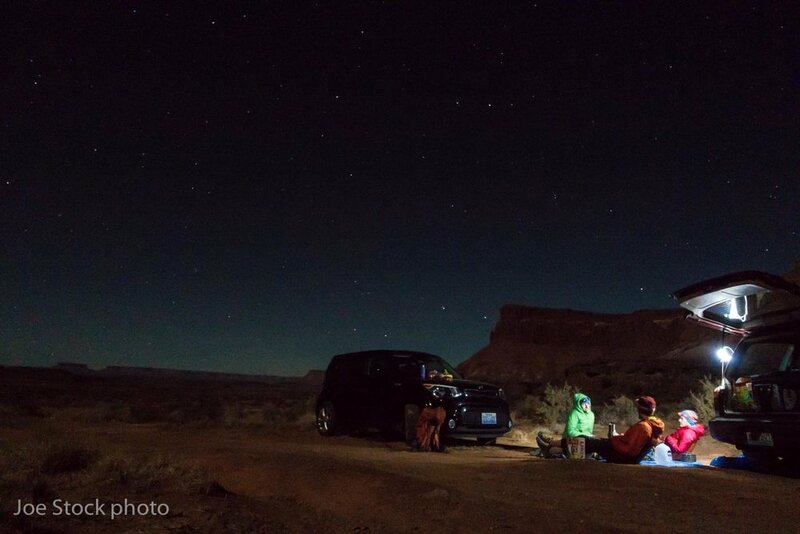 After Chamonix, we spent two months in Moab, Utah. Our rigorous schedule involved climbing a few days, then working on computers for a few days. We lucked into a small rental house from Geo Keyes. Geo is part of a desert tortoise research clan, several of whom are mutual friends in Anchorage. 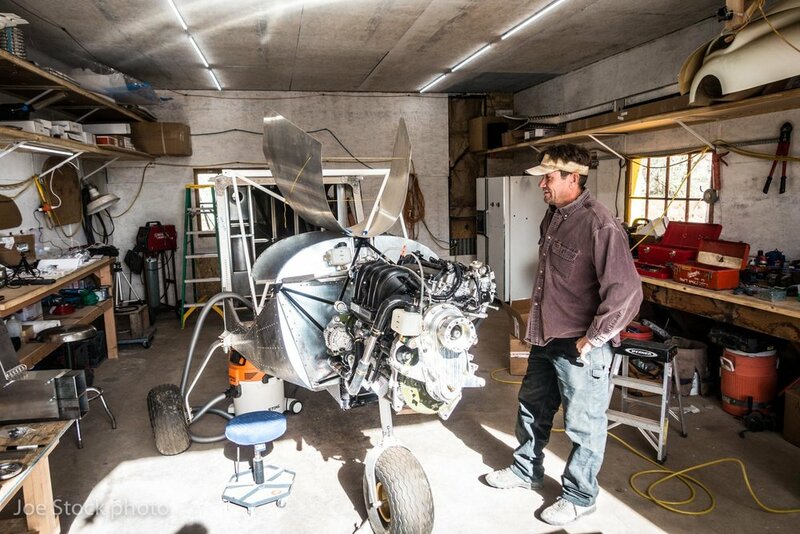 When Geo wasn't away chasing desert tortoise he was building a Kitplane. In recent years, Cathy and I have developed a knack for Mediterranean sport climbing. Desert climbing can't be any different. The desert cracks are physical and brutal and attract posses of loud 20-somethings. 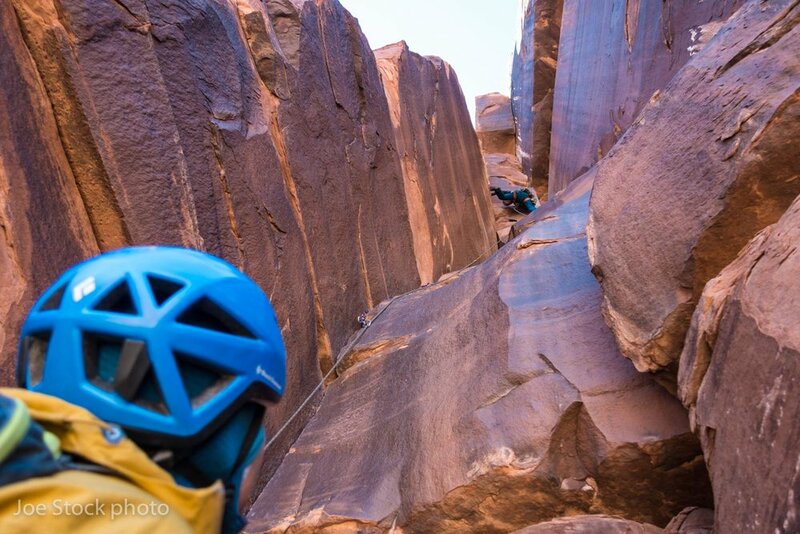 Mediterranean crags are quiet, yet packed with climbers age 5-70. Reverse culture shock for Cathy and Joe! Keeping expectations in check, my tick list included: Ancient Art, Castleton Tower and Indian Creek. We spent the first week at Wall Street remembering how to climb cracks. By the second week my tick list was complete. The rest of the trip exceeded all expectations. That's the nature of desert climbing. It's like nowhere else in the world. 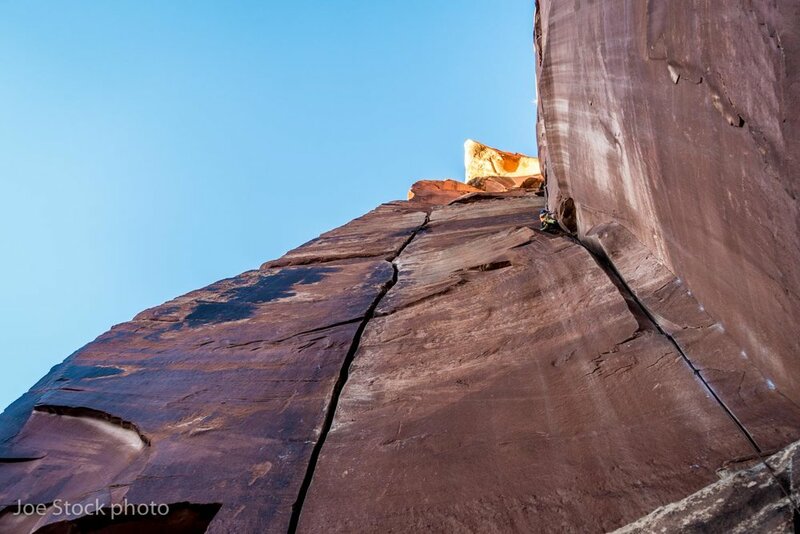 My favorite route of the trip was Program Director, an overhanging 170-foot 5.10 wide crack in Long Canyon near Moab. I started up the route with 43 cams, including ten #3 Camalots. Over the years of prepping for this trip we accumulated six sets of cams, a minimum needed for climbing the parallel-sided desert cracks. At the crag, climbers share cams to supplement their meager racks. We didn't have mountain bikes, so we ran trails on our days off. 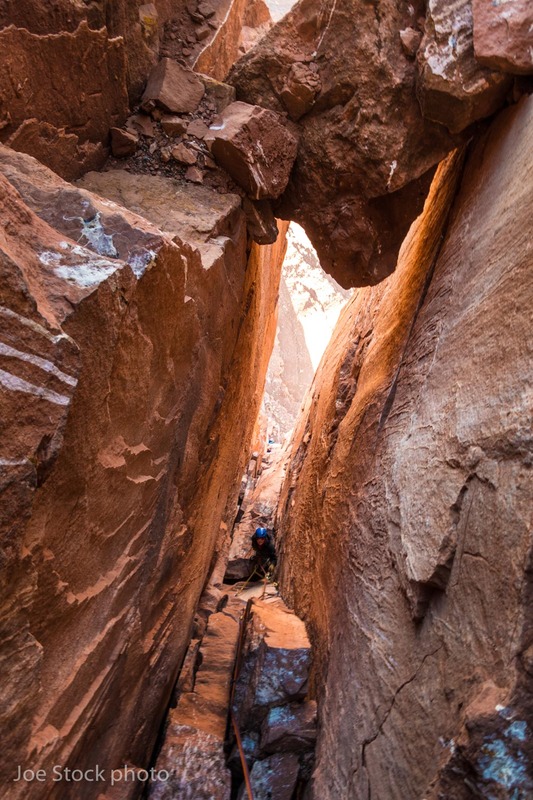 Slick rock domes and sandy trails up Wingate-walled canyons to pre-historic arches. It was difficult to control ourselves and not waste the energy we needed for climbing. Eric and Kat climbing a 5.11- at Wall Street. First objective: Castleton Tower. We first climbed the Kor Ingalls rotue (III 5.9+). A grade lingering from when 5.9+ was the top the scale. The crux is a bolt-protected off-width corner plastered with slippery calcite. Way up on a tower on top of a mountain. Airy! On our second visit to Castleton highliners had rigged a 500-meter line between Castleton and the Rectory, the long tower to the left of Castleton in this photo. 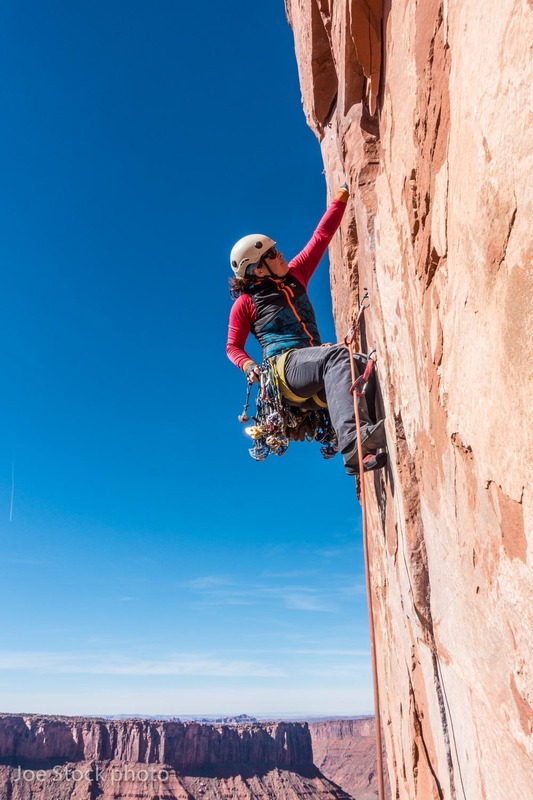 As we climbed, a Canadian woman set the woman's highline record. Cathy in the guano-filled third pitch of the North Chimney (III 5.9) on Castleton Tower. The crux was an off-width, sort of protected by an ancient 1/4-inch bolt. We brought a #5 Camalot, but the crack wanted a #6. Like many people, including Fred Beckey, we enjoyed the North Chimney more than the Kor Ingalls. Cece Mortenson from Revelstoke, British Columbia leading the second pitch of Jah Man (III 5,10c) on Sister Superior in Castle Valley. Another classic tower in Castle Valley. Second objective: Ancient Art (III 5.10c) in the Fisher Towers. Here's Cathy leading the mud chimney second pitch. Can I still count the route if my wife leads the entire route? Cortney belaying Cathy to the summit of Ancient Art. Arguably the craziest pitch in the US. Climb it before it falls down! 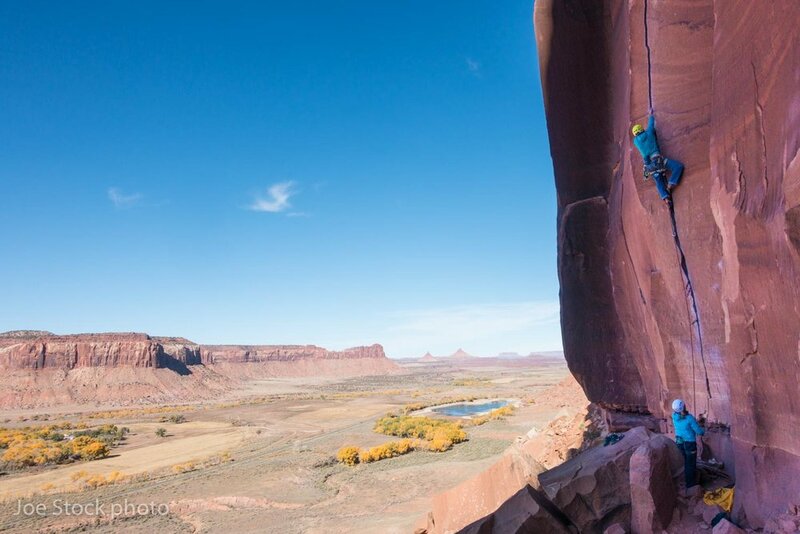 Third objective: Indian Creek, the world destination for crack climbing. Miles and miles of Wingate Sandstone lining the most beautiful desert valley I have ever seen. Here's Eric Larson belayed by his wife Kat on Scarface (5.11-). Cathy leading Our Piece of Real Estate, a 100-foot 5.11- at Indian Creek's Battle of the Bulge Buttress. 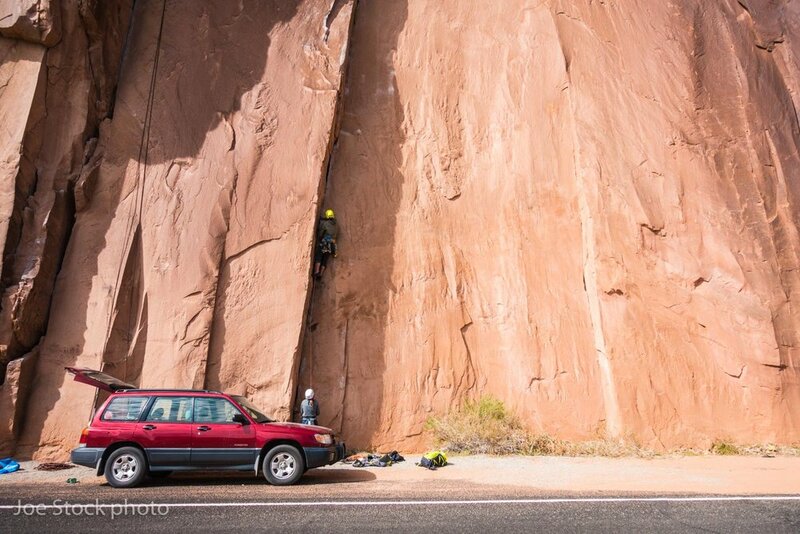 The off width crack on the left is called Big Baby. The most famous route at Indian Creek is a 5.10 called Incredible Hand Crack. The legendary alpinist Jim Donini sprayed me down with beta as I led Incredible Hand Crack. Our Anchorage buddy Elliot Gaddy leading the crux crotch-stretcher on Lonely Vigil, Lighthouse Tower, a five-pitch 5.10+. Car camping with Cortney and Tobey at Indian Creek. We weren't homesick. Thanks for the visits, crag days and evenings with beers Geo, Eric, Kat, Cece, Jayson, Cortney, Tobey, Chris, Tricia, Chad, Flynn, Big Sean, Little Sean, Sarah and Donna!